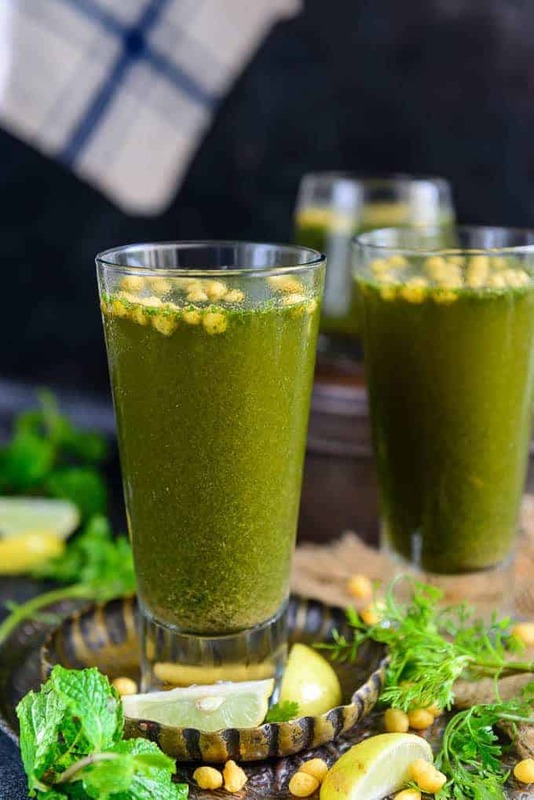 Jaljeera is one of the most popular Indian summer drinks which is made from fresh coriander, mint leaves, and roasted cumin powder. Apart from being refreshing, it is also a good appetizer. It is loved by one and all in North India. Most importantly, it tastes so tangy and pop on the palate that you would have it on repeats. So do try this Indian summer staple at home with my easy peasy recipe. Here is how to make Jaljeera Recipe. Just like Sattu Ka Namkeen Sharbat, Jal Jeera used to be one of those special coolers that my mom used to make every summer. The Indian summers are very ruthless. Hence, making this Jaljeera Masala works really well. Prepared from a plethora of soothing spice mix, Jal Jeera is a traditional Indian beverage. Mostly, this drink is made from fresh coriander, mint, rock salt, black pepper, roasted cumin seeds, dry mango powder, pepper powder, black salt. Yes, so it creates a riot on your taste buds. In order to make it more refreshing, if you wish then you may also add fresh mint leaves and coriander leaves, ice cubes and lemon juice to it while serving. This drink is not only refreshing but also a great appetizer. It aids in digestion and is good to drink when you have an upset stomach. It also has cooling properties and so it’s highly recommended to drink during the summers. Sometimes fresh greens are not available in the market or are too costly. In that case, you can make this dry Jaljeera Powder and make instant Jaljeera whenever you feel like drinking it. Here are the ingredients to make Jaljeera Powder. Mix all the ingredients well and store in a clean glass container. To make Jaljeera, mix 1 tsp powder in one glass of chilled water. Add some ice cubes and lemon juice and serve immediately. 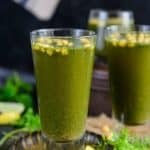 – It is a perfect drink to sip on during the warm days before meals and even after meals as it has cooling properties and keeps the body cool during harsh Indian summers. – It has a very rejuvenating, cooling effect and is considered to be good for digestion as well. – Most importantly, during summer, it hydrates the body and helps in maintaining our body temperature. – It aids in digestion and is a good appetizer. How long can we store Jaljeera? Jaljeera doesnt’ keep very well for long time. Since it has fresh mnt and coriander, it can turn bitter if kept for too long. I suggest making the Jaljeera and refrigerating it for 3-4 hours before serving it. You can refrigerate for up to 1 day before discarding it. I do not recommend freezing Jaljeera. It tastes best when made fresh. How to make Jaljeera Soda? To make Jaljeera Soda, follow the process as mentioned below but replace water with soda. Make the paste and keep it ready. When you are ready to serve, add soda and serve immediately. 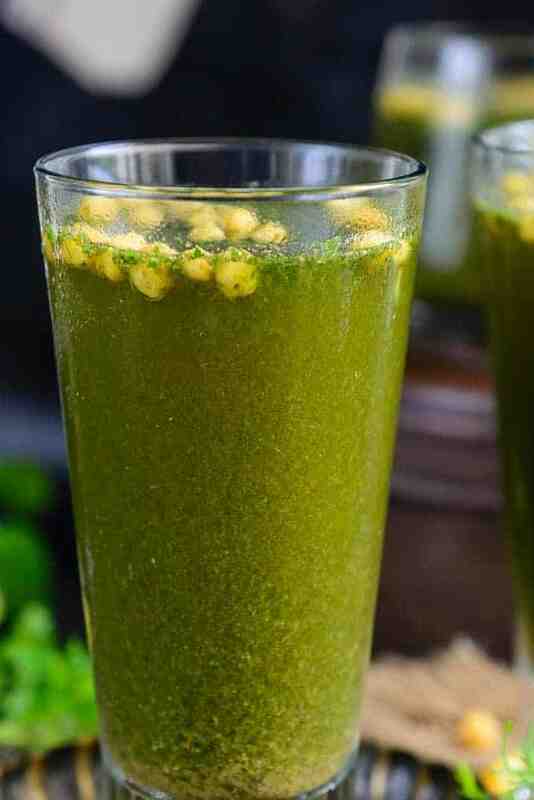 Jaljeera is a refreshing Indian drink made using fresh coriander, mint and roasted cumin powder. It is perfect to sip on hot, humid summer days. Wash the mint and coriander leaves. Blend them with ginger in a blender to make a smooth paste. Add 1/2 cup water while grinding. Transfer the paste in a big bowl. It is important to keep Jaljeera for a few hours before serving for the flavors to develop.